KNOWN as the ?Rice Bowl of Selangor?, Tanjung Karang (P95) is a small town with plenty to offer. To the uninitiated, this town is roughly about 82km from Kuala Lumpur city centre. There are many ways to get there, you can either travel by car from Klang or via the new Latar Highway that links Kuala Lumpur to Tanjung Malim (the highway has only been completed up to Assam Jawa). For the food lover, let us begin with the two state constituencies in Tanjung Karang: Sungai Burung (N8) and Permatang (N9). I?ll begin with Permatang where all the action is. If you love cendol, there?s Cendol Batu 9 (N 03 24.836, E 101 11.605) where a bowl of cendol biasa costs RM1.50. This is by far, one of the best dessert stalls around Permatang and is open for breakfast and lunch. Refreshing soup: Soto Bergedil from Warung Ibu. You can also find noodles and rice dishes served at this roadside stall. For the soto lover, highly recommended is the soto bergedil (deep-fried mashed potato with minced meat) from Warung Ibu (N 03 24.671, E101 11.817). At RM5 a bowl, the dish is simple as it is delicious. Warung Ibu also serves nasi ambeng, a special rice dish prepared by residents here of Javanese-descent. As a matter of fact, this particular rice dish is found in parts of Johor where there is a large Javanese community. A typical helping costs RM6 per plate. There is also kedai Nasi Ambeng (N 03 23.011, E 101 13.797) in Taman Nilam. But before you decide to sink your teeth into this local delicacy, let me tell you that it is an acquired taste. Narrow coastline: A deserted beach in Permatang. Basically, it is a mixture of rice, fried noodles, sweet tofu skin with tempe (soya bean cake), fried grated coconut and a piece of fried chicken. So, in a nutshell, you get everything in one go! Tanjung Karang, being a coastal town, is surrounded by fishing villages. There are two bagan (coastal fishing village) that are worth visiting. First off, there?s Bagan Pasir (N 03 24.371, E 101 10.327) where you purchase fresh seafood at decent prices. The makan place which is worth the mention here is Suang Le restaurant (N 03 23.988, E 101 10.284), famous for crabs fried with chilli and curry leaves. Further up the coast is Bagan Tengkorak (N 03 26.646, E 101 08.864) where you can visit the village?s cockles and clam processing centres. North of Tanjung Karang is Sungai Burung (N8). This is the place to be if you want to educate your children about padi growing. 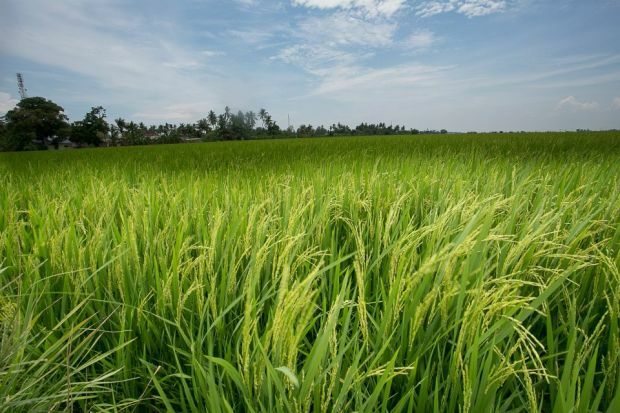 There are many privately-owned padi fields in the area and padi harvesting by mechanised harvesters is a sight to behold. 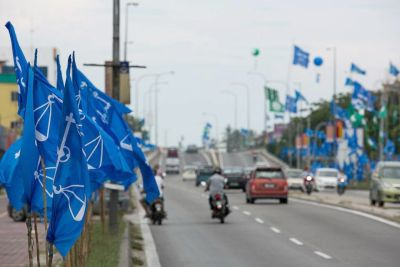 Flag season: The road leading to Teluk Intan in Tanjung Karang is decorated with political party flags as polling day approaches. The recommended areas for a drive-by tour are Sungai Sireh and Jalan Parit Serong. And back in Tanjung Karang town, if you intend to stock up your fridge with fresh seafood, a trip to the wet market is highly recommended because the fish stalls are open daily from 2pm until evening. Here, you will find the catch of the day from as far as Sekinchan, Sungai Besar and Hutan Melintang. Prices are very reasonable for the fresh produce. Tanjung Karang, Permatang and Sungai Burung are linked through the coastal Federal Road 5 and there are many modes of public transport available for commuters to get to this town. It is best if you can drive, as many of the places mentioned in this story are accessible by car.